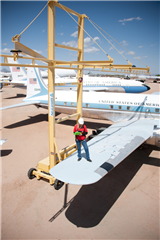 The Griffin™ by Rigid Lifelines® is a portable fall protection system that protects workers during vehicle maintenance. Reposition the Griffin with a small towing device to make vehicle access easier during maintenance. Visit www.griffinfallprotection.com for more information about the Griffin.